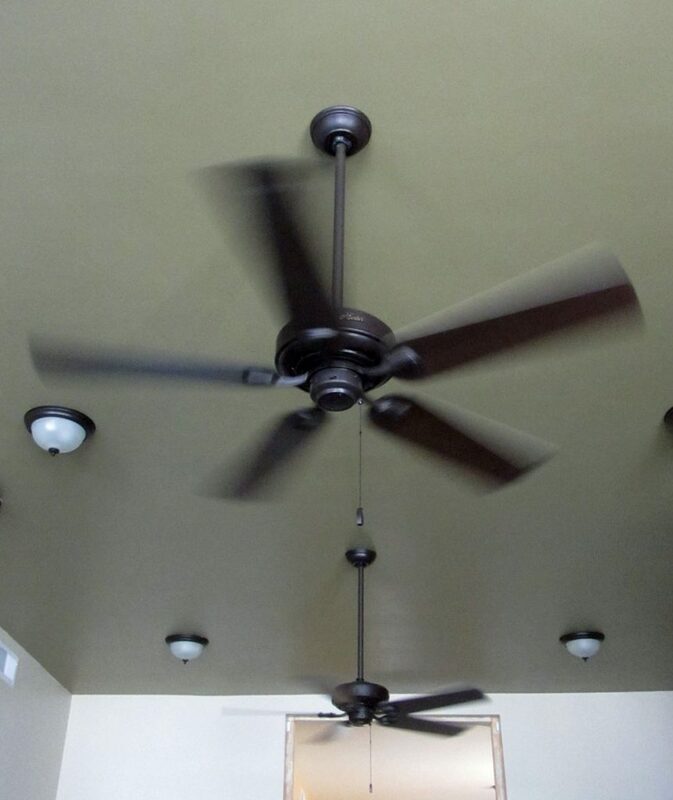 The hotel has seen several upgrades in the past two weeks with the most dramatic being the new ceiling fans. I bought six of these Hunter fans that I found on sale for 60% off. They look fairly accurate for the period design so they will be installed in all of the bedrooms and the living room upstairs as well as the saloon which is shown above. Pay no attention to those light fixtures. They are temporary and will be replaced by a set of antique fixtures when I get time to rewire them. The saloon is definitely more comfortable with the fans going which inspired one of the locals to drop in for a chance to cool off. 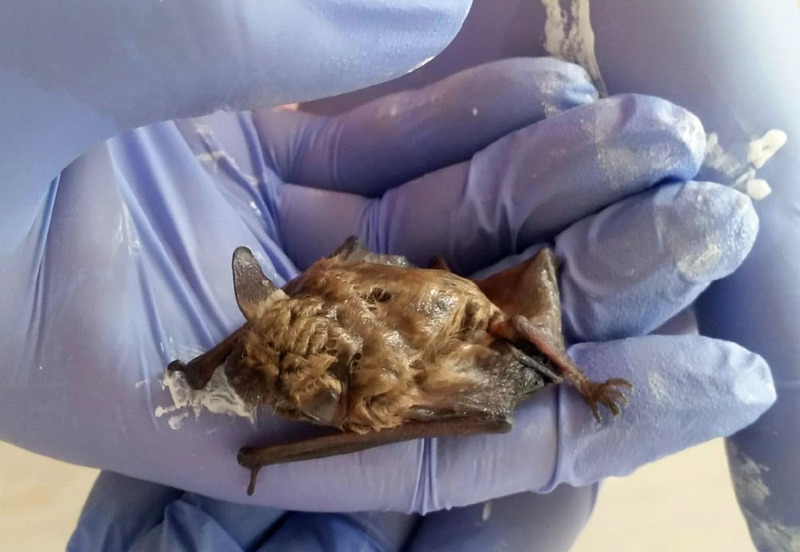 I found this little guy swimming around in a bucket of water that I had for mixing mortar. He was unable to fly out in his waterlogged state but was able to use his cute little turned up nose as a snorkel while awaiting rescue. When I fished him out, he was barely moving but he perked right up when Katie toweled him off. We set him outside in a box and he was on his way as soon as his fur was dry. Well, our bat friend is gone and another thing that is gone is the porti potty. You see, it’s Katie’s and my second wedding anniversary and although, it’s supposed to be a cotton gift, I opted for porcelain by installing a much needed toilet. I found that it wasn’t as hard as I’d feared and when I turned on the valve allowing water to rush into all the new plumbing, there were no unintended fountains, just a calmly filling toilet tank. It even flushes correctly! The big hurdle is getting used to indoor plumbing again. 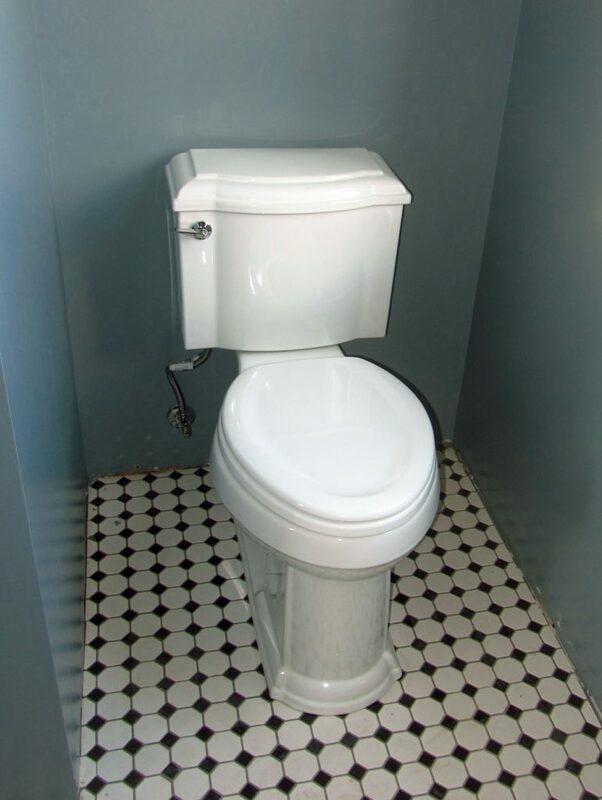 Of course, a properly flushing toilet demands a proper sink so I wrestled the vanity out of the garage and got to work. 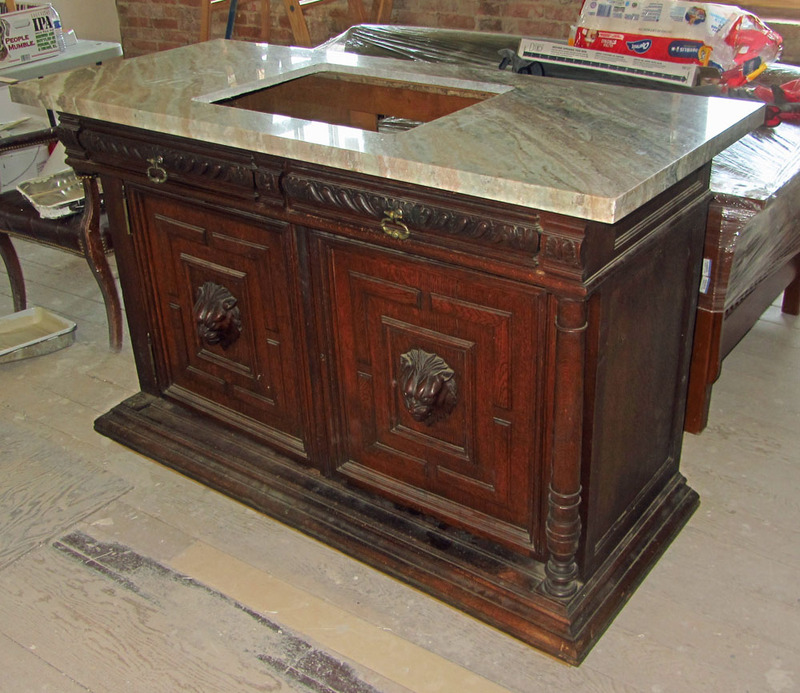 Katie and I purchased an old English buffet last year and when we got it home, we discovered that it was made up of parts from a couple of different pieces of furniture and had several instances of wood beetle damage. This actually worked better for me since I didn’t need to feel guilty when I removed the top and ripped the guts out. As for the beetles, they seem to be long gone with no new sawdust sifting out of the cabinet. Fingers are crossed. The granite counter top is new and the sink bowl will be a white rectangular porcelain model that looks similar to the toilet. We made a point of buying the tub, toilet and sink from the same manufacturer to make sure that the white glazes would all be the same. The cabinet itself posed a few problems like remounting the drawer fronts permanently after removing the drawer boxes. As you’ll also note, the column on the left is missing. It was pretty banged up on the bottom so Papa Geppetto will have to do a little repair work on it but it should look fabulous once done. Despite its flaws, the whole thing looks rather extraordinary and with a coat of wax, it will look even better. By the next post, the vanity will have the sink bowl installed and all the plumbing hitched up.